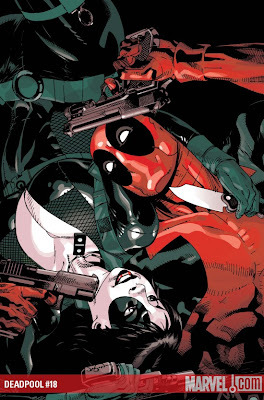 All in all, this latest issue was solid all around – while the jokes were kept to a minimum to allow the story to finish, it was still fast-paced, and the payoff was key for both the X-Men and for Deadpool, with the promise of more fun and frenzy to come very soon.
. I'm hoping that Daniel Way keeps up his brilliant writing as Deadpool continues a year of trying to be a hero. Way just continues to deliver a funny comic issue after issue and he really has nailed how to write the character. his issue in particular shows that Way knows this character inside and out: how to position him for the best comedy affect and who to pit him with or against to make his unpredictability that little bit more exciting and fun. The balance of things, once again, shows how well writer Daniel Way balances humor with action and plotting, while the all-star art team of Paco Medina, Juan Vlasco and Marte Gracia again deliver in every way, from facial expressions (Wolverine's exasperation, Norman's smugness) to the visual balance of scenes (where's the shot coming from? Nice ...) was perfect.